This is a special post for all of you! I've decided to start having guest post by fellow Beauty Bloggers! My First one comes from Hello Miss Niki! I have met this gorgeous beauty via all the social beauty networking that all of us seem to be link too! I really admire her & her blog! She has such passion in what she does! When I asked her about doing this I automatically wanted her to do a polish post b/c well I've never done one for you and she pretty much has every shade under the rainbow! Perfect fit! 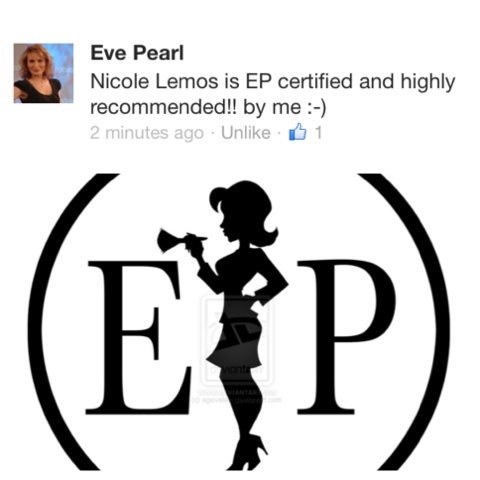 Niki, I thank you for taking the time away from your blog to give mine something it was lacking! It means the world to me that you did this for my readers & I! Xo's Girl! Hello Miss Niki's Top 5 Holiday Polishes! Who loves the holidays as much as I do? This is my absolute favorite time of year! Everything from the weather to the parties, the Christmas music and more…its just an overall happy season. One of my top favorite things are all the beautiful colors; and what better way to celebrate the holidays by wearing festive nail colors? After several days of going through my nail polish collection, I finally narrowed it down to my Top 5, and I am thrilled to share them with you! Enjoy!!! This polish was a last minute addition because I only picked it up from Sally’s Beauty Supply two days ago. I am certainly glad I did because I think I found my top nail polish of the holiday season! 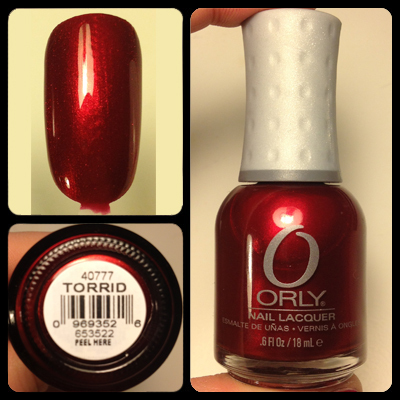 Orly Torrid is a gorgeous red metallic shimmer and screams Christmas! I swear, you can look up swatches and take photos, but none of them do justice to this color in person! It is just perfect and my number one holiday favorite! Red is my favorite color all year round, so how can I not have at least two different shades of red in my top favorites? 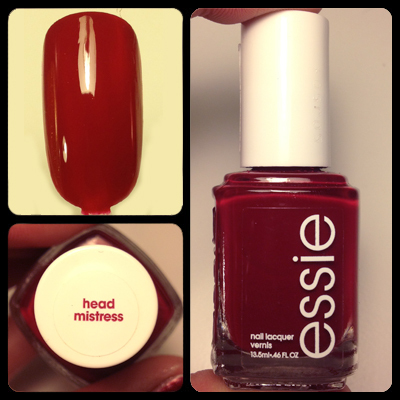 Head Mistress is from Essie’s Fall 2012 Stylenomics Collection. It is a bold, creamy deep red that can be worn 365 days a year. I wanted to add this to my top five because it is indeed very versatile but works especially well for the Fall and Winter Season. Having a classy red shade to is always safe to wear to parties, work or wherever! Come on…sing with me now, “Silver and GOLD, silver and GOLD, means so much more when I see…” (ok…yes…I’m a that crazy Christmas lady) Moving on, gold is a MUST in any holiday polish collection! It screams festive and its so much fun! 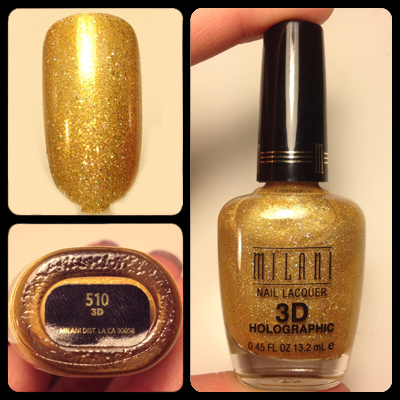 Milani 510 is apart of the 3D Holographic Collection and is a bright gold with tiny specs of glitter. What I love about this polish, is even though it is glitter it applies very smooth, giving it a real golden look! I have had this polish for months, as I was saving it for the holidays! Want me to start singing again? Don’t worry…I won’t do that to you guys! Along with gold, of course comes silver! I was never really big on glitter nail polish, until I started beauty blogging. Over time, I grew accustomed to it, and certain shades and textures I just love! 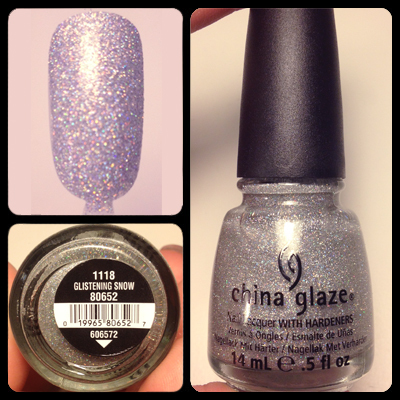 My favorite nail polish brand EVER is China Glaze! I love the quality and variety of their products! Glistening Snow is from the Holiday Joy 2012 Collection (review on my blog coming soon) and is a fine silver glitter that…well…glistens like diamonds! Not only is this great for the holidays, but perfect to wear with black nail polish for New Years Eve! China Glaze makes an appearance once again! I am very particular with the green nail polishes I purchase. Like glitter, green was never a favorite shade of mine, but this combination is just amazing! This color is also from the Holiday Joy 2012 Collection and is a gold-flecked green glitter. The photo above does not do justice to the shade in person. It is very pretty and although I have not worn it yet, I am very excited to finally throw it on closer to Christmas! There you have it! My Top 5 Nail Polishes for the Holiday Season. I literally had over 20 nail polishes that I was swatching on nail wheels trying to determine which ones were my favorite. Honestly, this was probably the hardest blog I've had to write because I just loved them all! However, these five polishes are just perfect for this season! The most important thing is to feel good and have fun! 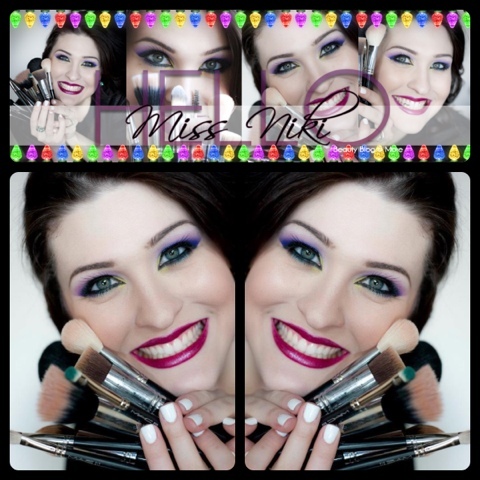 Nikki – It means so much to me that you allowed me to write a guest post for you! You really are an amazing blogger, and partnering up with you has been an absolute honor! I look forward to working with you again in the future! Let us know which shades speaks to you! These are amazing colors :) Some I need to add to my collection! Ahh this was fun! My fave has to be Essie since I'm more into "the classics" these days. Beautiful color! Great picks! I love them all especially Torrid. I think they are also perfect for this coming holiday season.